Torn between modern and traditional? Contemporary and classic? Sometimes, we just can not seem to choose the perfect style genre for our home. That's where the eclectic style comes to the picture! For those who wonder what eclectic defines as, it's the popular adjective in interior design parlance, meaning a decor that contains heterogeneous elements—a mixture of textures, time periods, styles, trends, and colors. There's something dynamic about a space that resists the urge to meticulously match items in one design style. Let's face it: most of us are eclectic. We like a little of this and a little of that. We may have items we've collected over the years, representing different aspects of our personality. Why not bring your different personalities in your interior spaces? 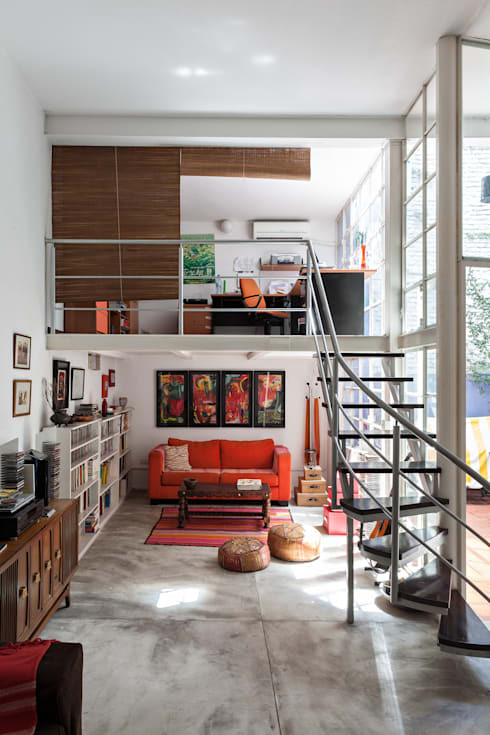 Check out this stylish eclectic home you will definitely love! When it's done well, eclectic broadcasts your confidence in your own style yet adheres to the fundamentals of good design. You do not have to choose between profiles or periods; there's room for a range of favorites. 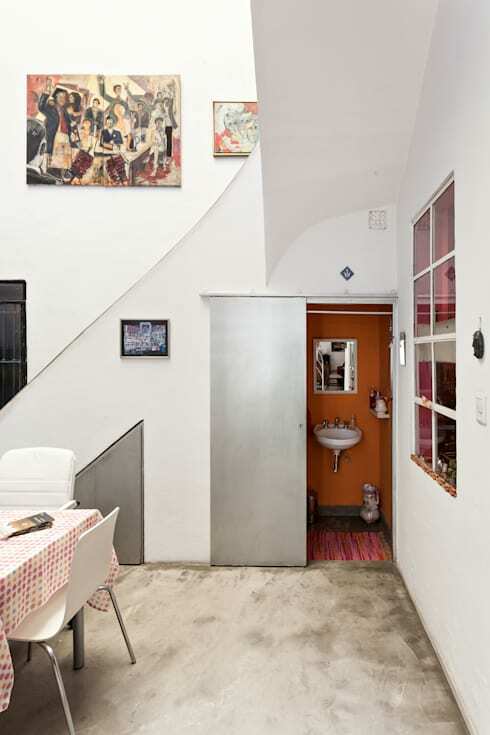 The interiors on this house speak eclectic all over. Let's check out all the stylish parts of the house! White is used as the base color of the home that's seen all throughout the walls, ceiling, and floors of the house. 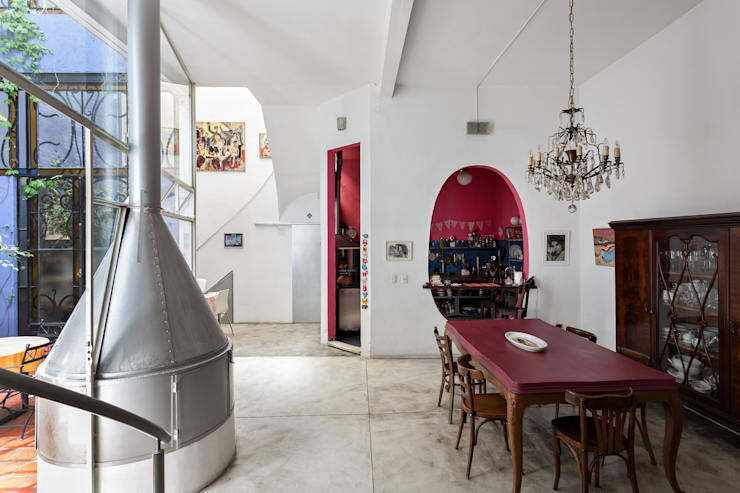 It acts as a canvas for the other components to boast its style and colors. 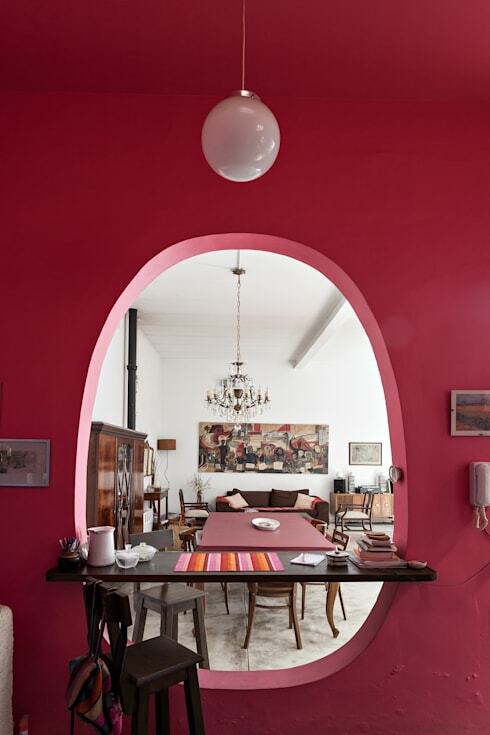 Seen in this picture, the kitchen and dining area oozes in lovely tones of a pinkish purple color, Magenta. So chic and contemporary! A slightly unusual yet stylish approach to interior designing, this eclectic kitchen area features a cropped out window frame that allows homeowners to take a peek on what gastronomical magic is happening inside the kitchen! Try to spot the small, quirky details in this angle. Pictured above, a part of this area is decorated with tiny wall decor that flourish in different colors and shapes. What a fun way to decorate this eclectic house! 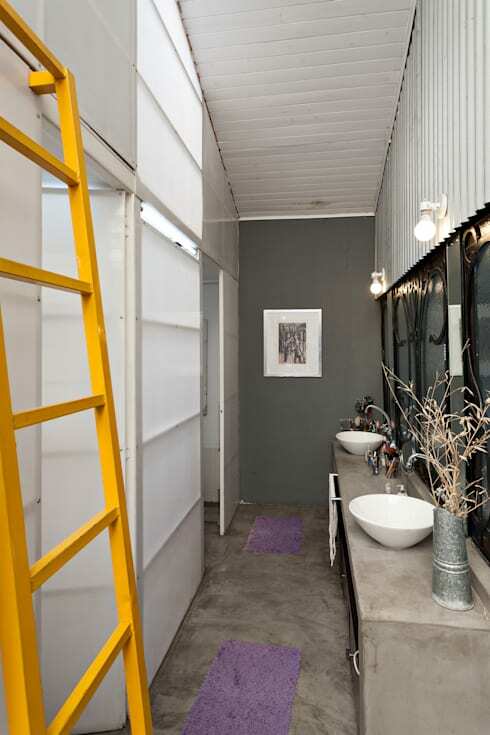 This stairway keeps a hidden gem underneath it -- a bathroom! And yes, we consider it as a gem because of its beautiful interior details. Another contemporary color, this bathroom offers us burnt orange walls that remind us of Moroccan tones. 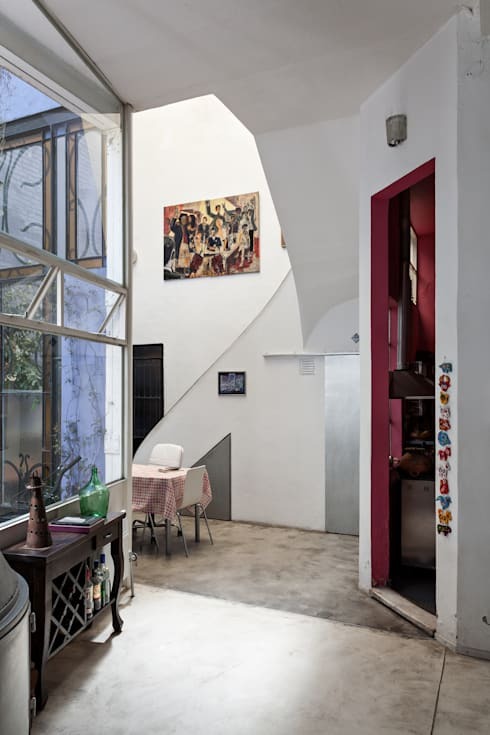 In this angle, you can clearly see an industrial staircase dividing two eclectic rooms of the house -- the living area and the home office area. The living room boasts a touch of Bohemian style with its warm orange colors and wooden elements. On the other hand, the office area features a modern style of interior design where touches or orange can also be seen. Brown window blinds serve as a partition for the area to have a little privacy when needed. If you're feeling the Bohemian style of this living room, check out this ideabook on ’How to bring that bohemian-chic vibe into your home’. 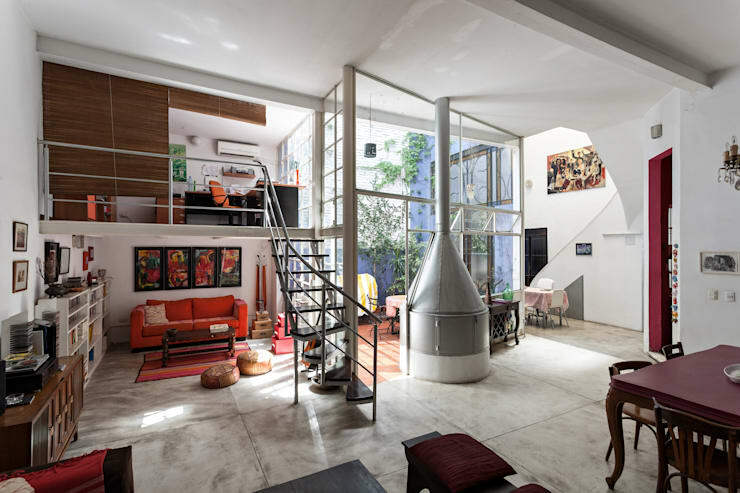 This eclectic home seem to have everything in it! It offers a stylish music room that features very similar colors found in the living areas of the house. Going down the hallways, the house provides a neutral palette with a splash of contemporary colors, thanks to this decorative ladder piece. Moving up to the Master bedroom, the eclectic style still flourishes. 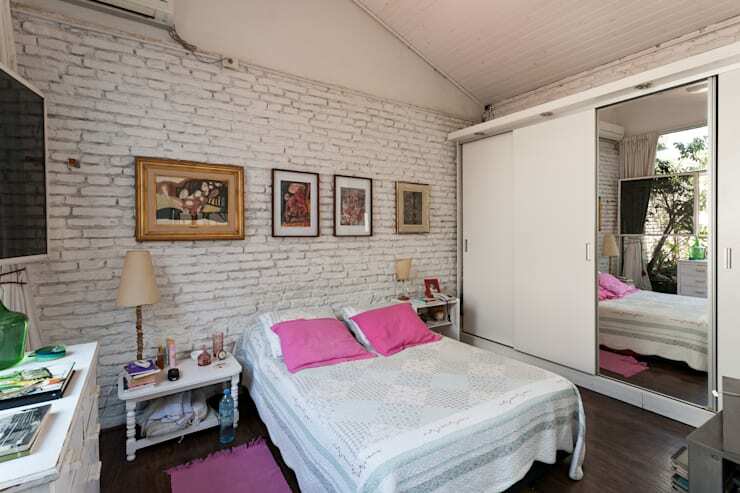 An ounce lighter than magenta, this dainty bedroom offers dashes of pink that makes the room very feminine. The brick wall, as well as the abstract photographs, accentuate the play of style genres in the house's interiors. 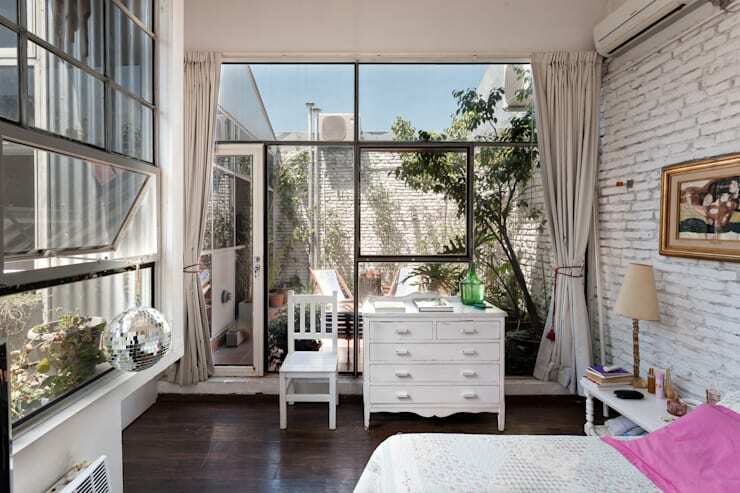 This bedroom doesn't seem to run out of windows! 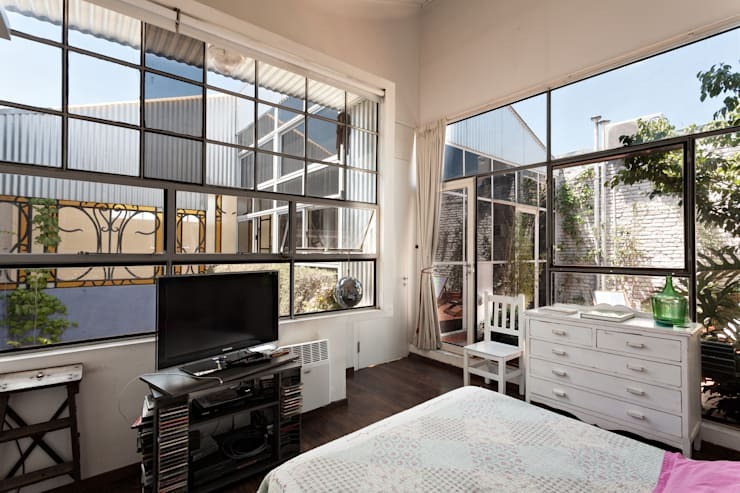 A wide set of industrial glass windows go all out crazy all throughout the room, bringing in a full glow and natural light. The bedroom provides the homeowner an easy way out to a relaxing patio. 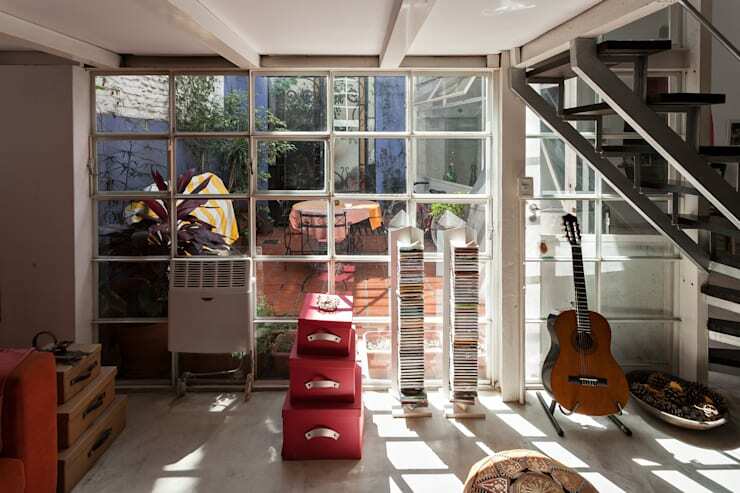 Pop Arq surely did it right designing this home the eclectic way, and that includes the outdoor enclosures. Nothing is more refreshing than a good lounge outside your home. This outdoor patio showcases a great fusion of styles through its church-like windows and doors and traditional furniture pieces. 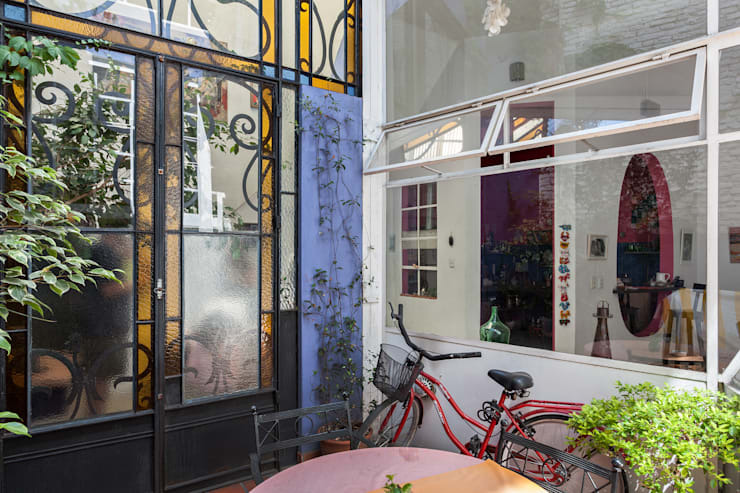 The glass doors are also decorated with intricate steel sidings that create a medieval feel to the patio.